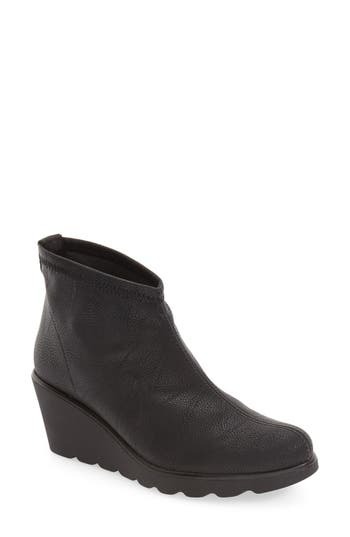 A slouchy instep, elastic goring and a generously padded footbed give this low wedge bootie a comfortable all-day fit. 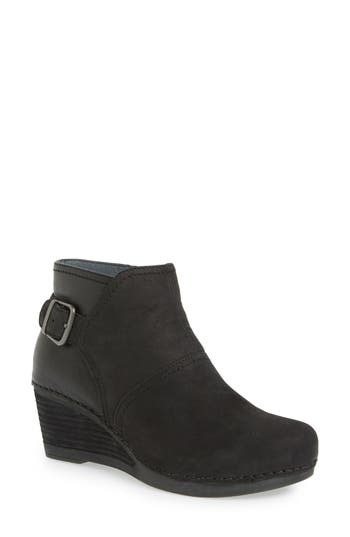 Style Name: Dansko 'sheena' Slouchy Wedge Bootie (Women). Style Number: 5129580. Available in stores. Textured leather straps with gleaming hardware crisscross the shaft of a quintessential wedge bootie that's sure to be a go-to in your everyday wardrobe. Style Name: Hispanitas 'Larae' Wedge Bootie (Women). Style Number: 5204872. Available in stores. Basket-woven elastic with metallic sheen perfects the custom, comfy fit of a super-lightweight wedge bootie with a cool exposed-zip closure. Style Name: Bernie Mev. 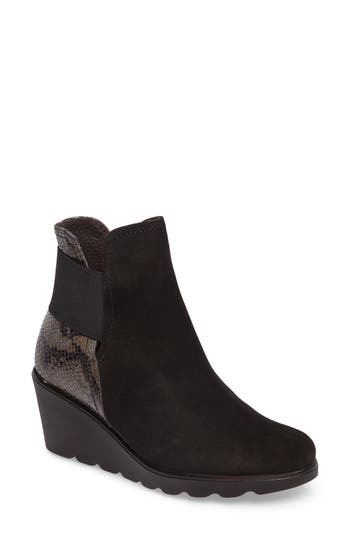 'Zigzag' Wedge Bootie (Women). Style Number: 1068219. Available in stores. Chukka-inspired lacing and a roomy round toe detail this versatile bootie with a low hidden wedge and a grippy articulated sole. Style Name: Wolky 'Dusty' Hidden Wedge Bootie (Women). Style Number: 5213446. Available in stores. Add a wild touch to your off-duty look this season in a striking streamlined bootie minimally detailed with tonal stitching and a covered wedge. A thick, lugged platform and a blissful bit of cushioning inside, complete with heel padding and arch support, make this a super-comfortable wardrobe essential. 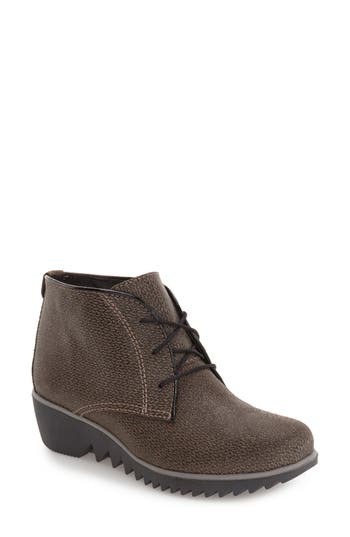 Style Name: Isola Jadyn Wedge Bootie (Women). Style Number: 5207595. Available in stores. With a '60s mod profile and a lightly cantilevered wedge sole, this soft nubuck bootie adds some playful fun to almost any wardrobe. 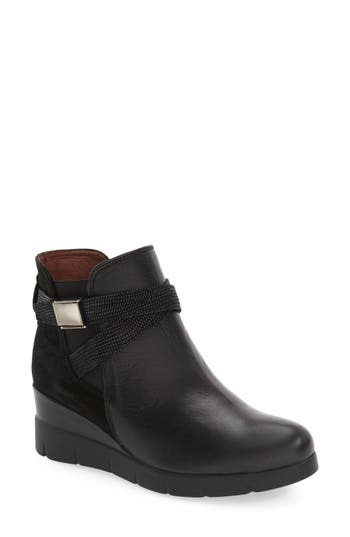 Style Name: Arche 'Detyam' Wedge Zip Bootie (Women). Style Number: 5194970. Available in stores. A grippy textured sole and wedge heel put a modern spin on a classic Chelsea boot fitted with a cushioned footbed for all-day comfort. 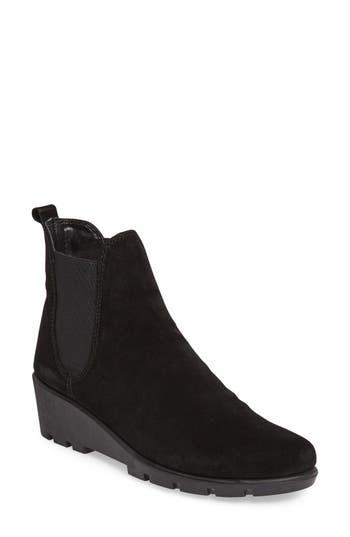 Style Name: The Flexx Slimmer Chelsea Wedge Boot (Women). Style Number: 5167584. Available in stores. Everyday comfort, weather-ready versatility and timeless style come together to make this platform wedge bootie an around-town must-have. Signature Soft Air technology provides a well-cushioned, shock-absorbing ride, while the waterproof Gore-Tex lining ensures fuss-free wear even in wet, rainy conditions. A snake-embossed leather strap completes the well-equipped bootie with a flash of sophistication. 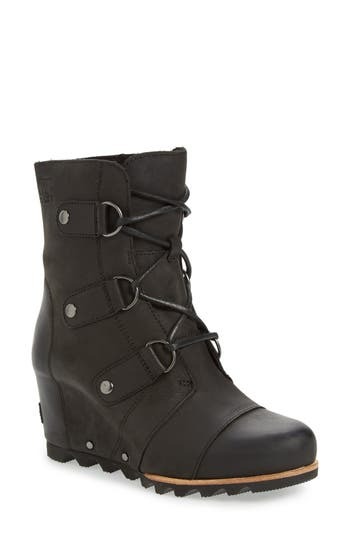 Style Name: Mephisto 'Tyba' Waterproof Wedge Bootie (Women). Style Number: 5130483. Available in stores. A wide buckled-harness strap lends a moto-inspired vibe to a chic leather boot featuring a tweedy woven collar and set on a wedge platform sole for just-right lift. 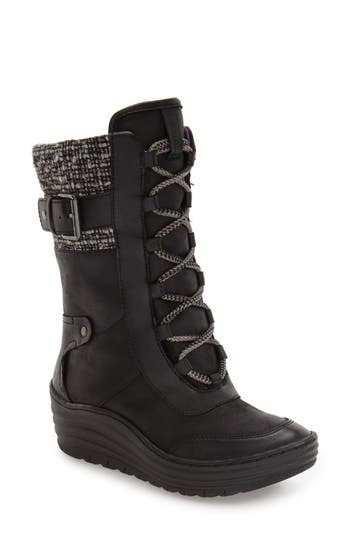 Style Name: Bionica Garland Waterproof Wedge Boot (Women). Style Number: 5213889 1. Available in stores. Two patent buckle straps shine from the ankle of a buttery-soft leather bootie set on a moderate wedge heel that's versatile and on-trend for fall. Naturalizer's innovative N5 Contour Technology exemplifies the brand's attention to superb comfort, creating an everyday boot with molded dual-density foam cushioning, a contoured insole board and flexible rubber sole, all in a lightweight design. Style Name: Naturalizer 'Nikole' Wedge Bootie (Women). Style Number: 5245593. Available in stores. Modern sophistication and cool street style merge in a suave wedge bootie featuring clean lines and a sporty contrast sole. 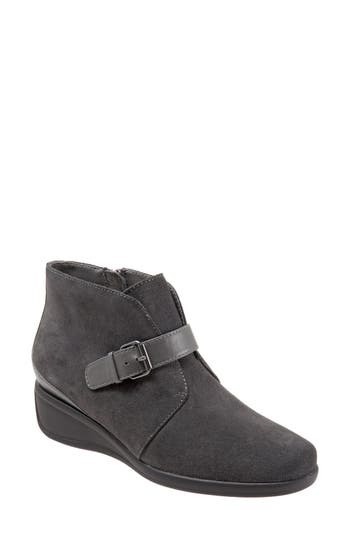 Style Name: Linea Paolo 'Felicia' Wedge Bootie (Women). Style Number: 5210306. Available in stores. A supple, stretchy upper distinguishes a comfortable bootie with a chunky rubber heel. Style Name: Toni Pons 'Baltic' Wedge Bootie (Women). Style Number: 5251848. Available in stores. Floral-stitched accents decorate the eyelets of a trend-right bootie shaped from smooth leather and set on a sturdy rubber sole. 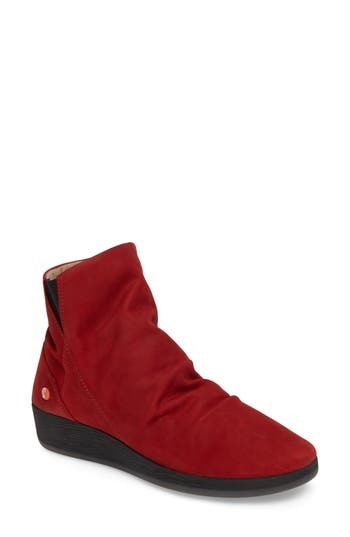 Style Name: Pikolinos 'Maple' Wedge Bootie (Women). Style Number: 5070420. Available in stores. 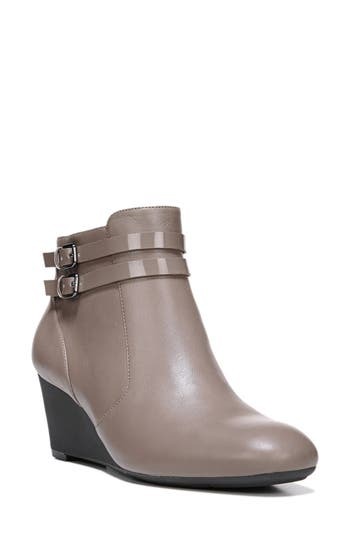 A slender buckled strap adds subtle dimension to an everyday wedge bootie fashioned with a cushioned insole and moisture-wicking lining for comfort that lasts all day. 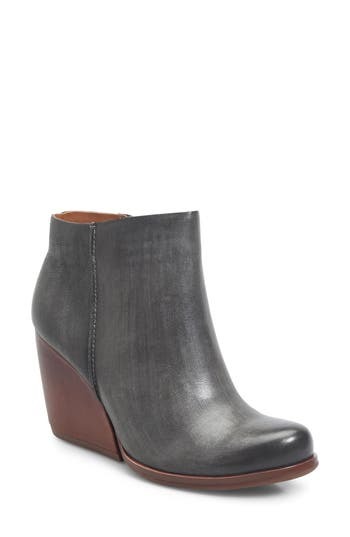 Style Name: Trotters 'Mindy' Wedge Bootie (Women). Style Number: 5187097. Available in stores. A stacked, stable wedge adds just-right height to this attractive, comfortable bootie that features a removable, cushioned footbed with excellent arch support and a 3M Scotchgard finish to keep it looking great year-round. 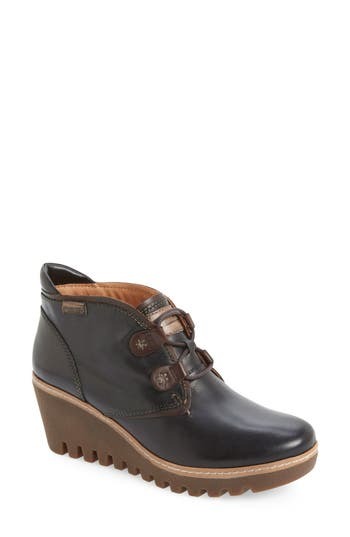 Style Name: Dansko 'shirley' Wedge Bootie (Women). Style Number: 5130832 1. Available in stores. An easy wedge modernizes a slopes-inspired boot designed with durable D-rings and a sturdy, razored-lug sole. 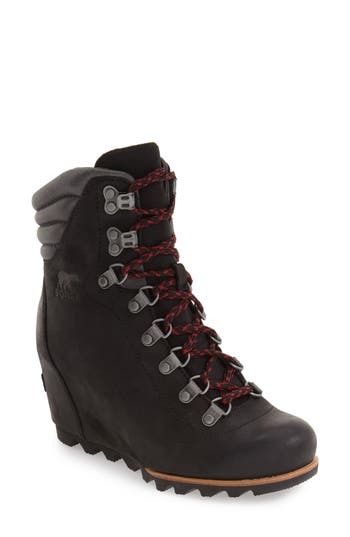 Style Name: Sorel 'Joan Of Arctic' Waterproof Wedge Boot (Women). Style Number: 1065545. Available in stores. 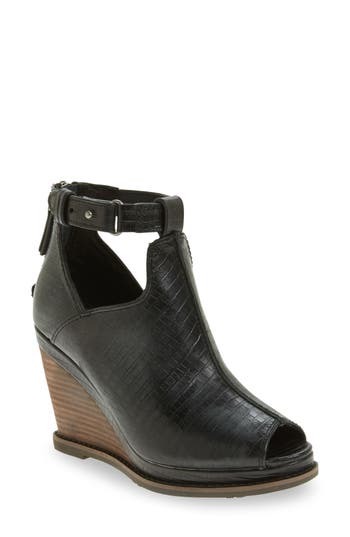 A lizard-embossed cuff adds a hint of exotic appeal to a stacked wedge bootie designed for easy everyday comfort. 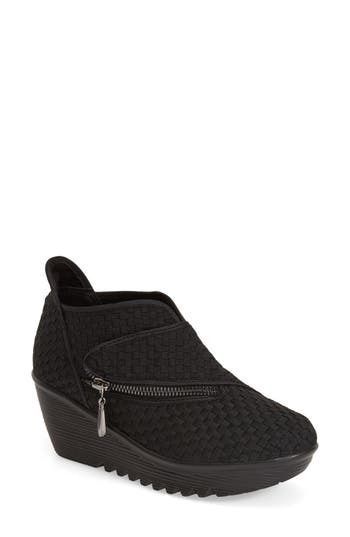 Style Name: Otbt 'Dharma' Wedge Bootie (Women). Style Number: 5156431. Available in stores. Burnished leather in overlapping panels enhances the everyday sophistication of a comfort-centric bootie featuring a cushioned, contoured insole and shock-absorbing rubber sole. 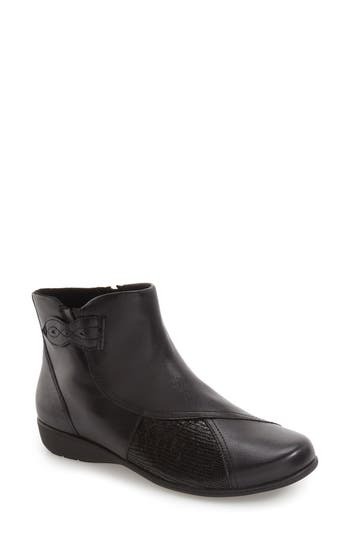 Style Name: Aravon 'Anstice' Wedge Bootie (Women). Style Number: 5259896. Available in stores. Keep it svelte with the cool angles and covered wedge of this almond-toe bootie, made ever so edgy in tactile calf hair. 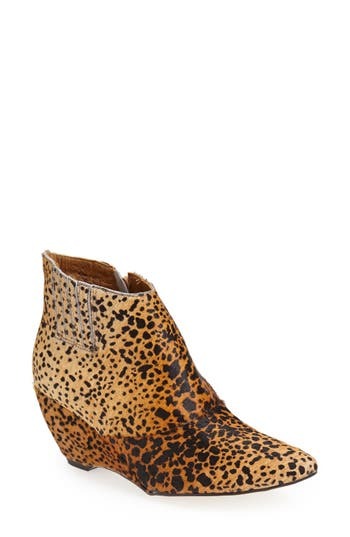 Style Name: Matisse 'Nugent' Wedge Bootie (Women). Style Number: 993437 3. Available in stores. A cowgirl-inspired bootie made of subtly weathered suede is lifted by a substantial block heel and detailed at the shaft with a simple raised seam and a convenient zipper, making it modern, versatile and easy to wear. 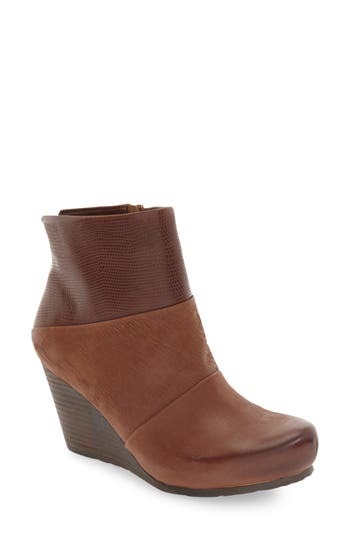 Style Name: Kork-Ease Natalya Wedge Bootie (Women). Style Number: 5349776. Available in stores. Soft pebbled leather furthers the comfy feel of a low wedge bootie styled at the shaft with a wedge of goring and an angled zipper and finished with a lightweight cushioned sole. 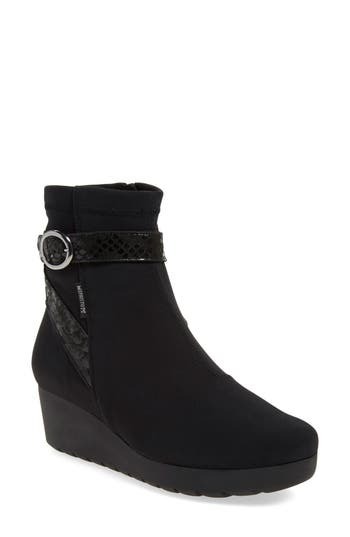 Style Name: Softinos By Fly London Ayo Low Wedge Bootie (Women). Style Number: 5435018. Available in stores. Chunky whipstitching adds to the Western-inspired character of a full-grain leather wedge bootie that adds a little cowgirl sass to everything from summery frocks to your favorite frayed denim. 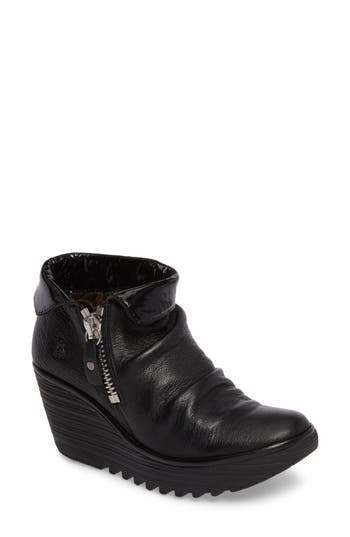 Style Name: Ariat Belle Wedge Bootie (Women). Style Number: 5310137. Available in stores. 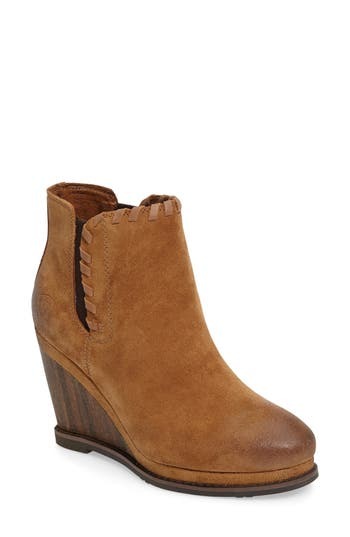 Oiled suede adds a hint of rustic charm to a sophisticated and versatile stacked-wedge bootie. Style Name: Ariat Backstage Wedge Bootie (Women). Style Number: 5310054. Available in stores. 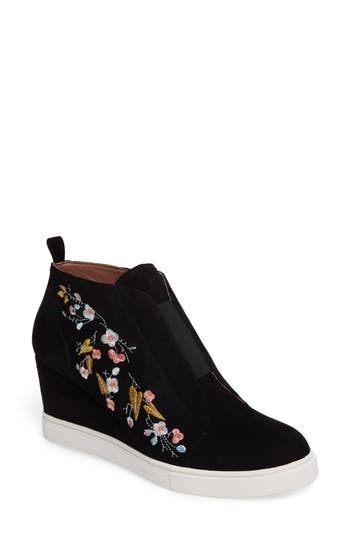 A hidden wedge heel grounds this floral-embroidered bootie in contemporary-chic style. 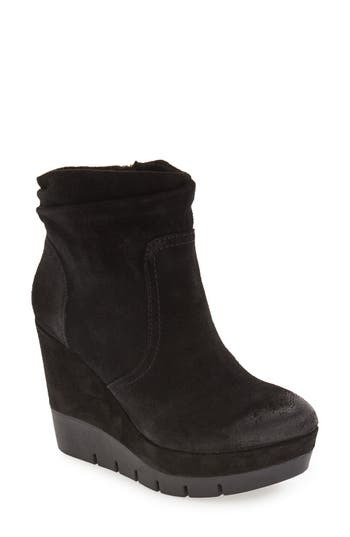 Style Name: Linea Paolo Felicia Ii Wedge Bootie (Women). Style Number: 5420847. Available in stores. Your favorite Hunter rain boot gets a sleek update in thinner, more flexible rubber with a wedge heel and a tailored, slimmer silhouette. The curve of the toe has been pared down to be less prominent, while the sole has been molded for a more classic appearance. 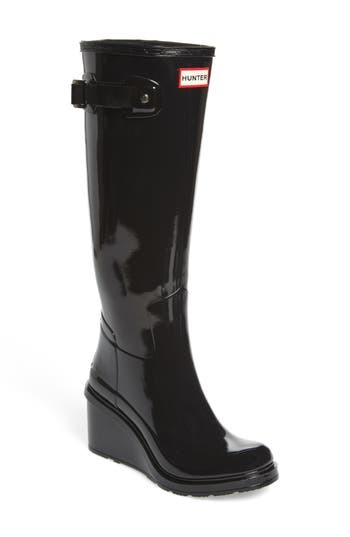 Style Name: Hunter Original Refined Wedge Rain Boot (Women). Style Number: 5196895. Available in stores. 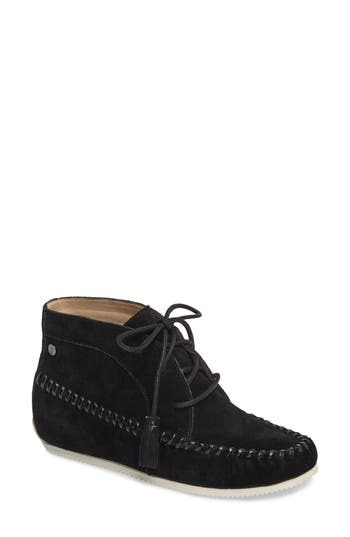 A low concealed wedge and a generously cushioned footbed add lift and comfort to a suede moccasin boot made with whipstitching at the toe and a grippy, textured sole. Style Name: Hush Puppies Kinsee Carine Hidden Wedge Boot (Women). Style Number: 5373370. Available in stores. A bold zipper and contrast turndown cuff add a splash of fun to this round-toe bootie lofted by a striated platform wedge sole. 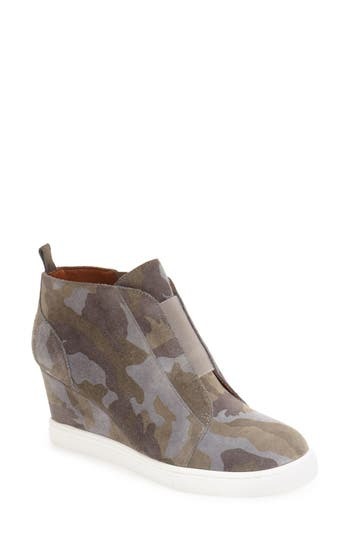 Style Name: Fly London Yoxi Wedge Bootie (Women). Style Number: 5391977 1. Available in stores. Crafted from waterproof full-grain leather, this classic microfleece-lined boot keeps your feet warm and dry in wet or snowy weather. The hidden wedge adds just the right amount of lift while the articulated lug sole provides added traction and stability. 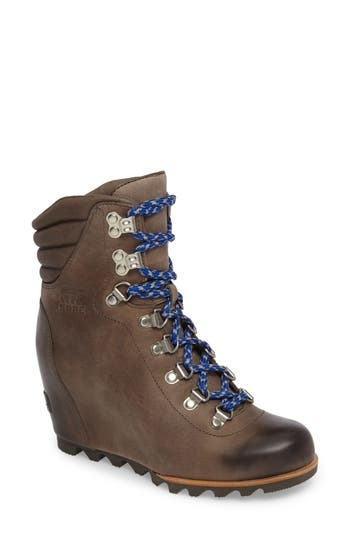 Style Name: Sorel 'Conquest' Waterproof Wedge Boot (Women). Style Number: 5131715. Available in stores. 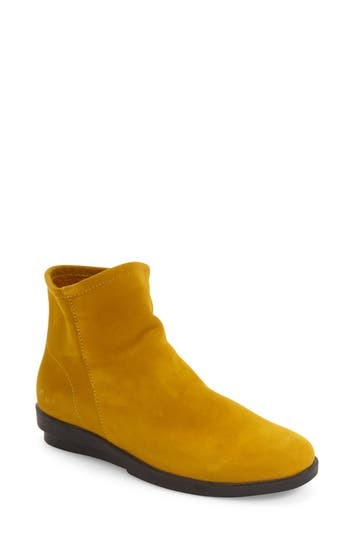 A soft suede and faux snakeskin upper distinguish a comfy bootie with an elasticized band that wraps around the back and a chunky rubber wedge. Style Name: Toni Pons Bari Wedge Bootie (Women). Style Number: 5457181. Available in stores.